Autumn 2015. Very dry and hot summer had left deep scars into glaciers and melted iternal ice. Everyone complained about bad conditions. “No north face action this time.” I disagreed. There were photos in Instagram which showed clearly the shining neve line up to Eugster Direct`s deep couloir. A perfect acclimatization route! Eugster Direct´s huge couloir clearly visible. 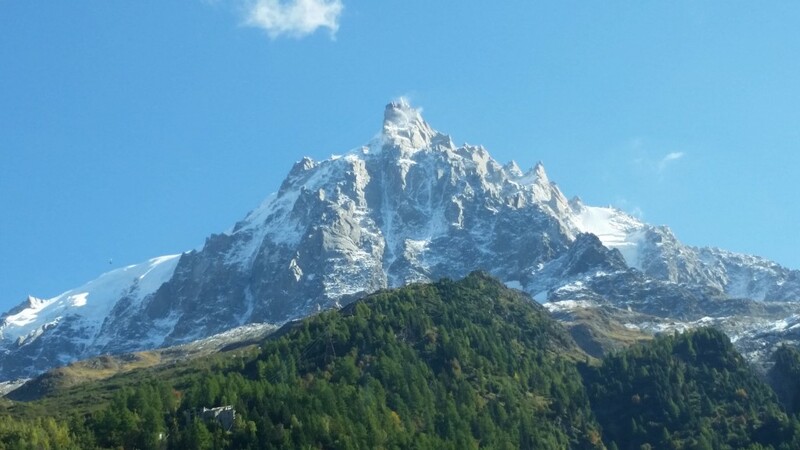 We flew to the Malpensa on the 1st of October and drove to the Chamonix valley. Last bin up to Plan du Aiguille had left ten minutes earlier. Evening walk up to was torturous in a warm Autumn air with heavy packs. Dehydration after the flight wasn´t helping too much either. 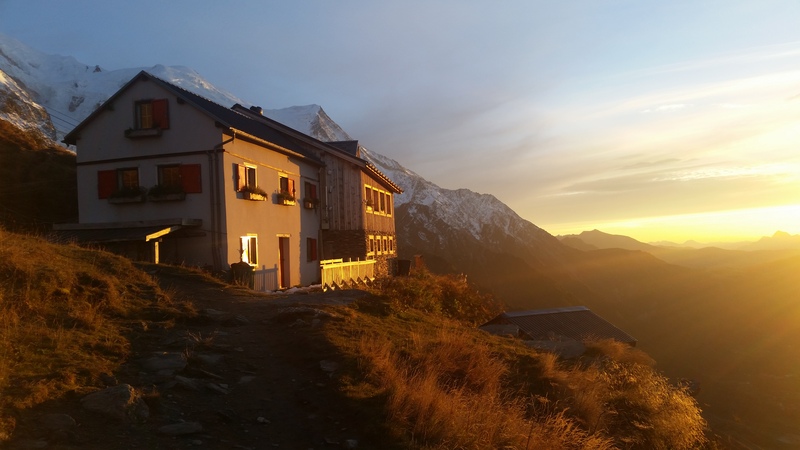 At sunset lights we set up a tent close to the Plan d´Aiguilles station. A few hours of much needed sleep waited. Evening hike up to Plan d´Aiguille. The very first thing in the morning was hopping on snow covered rocks. Approach was a short walk, but probably the most dangerous part of the day. Too easy to spread an ankle. 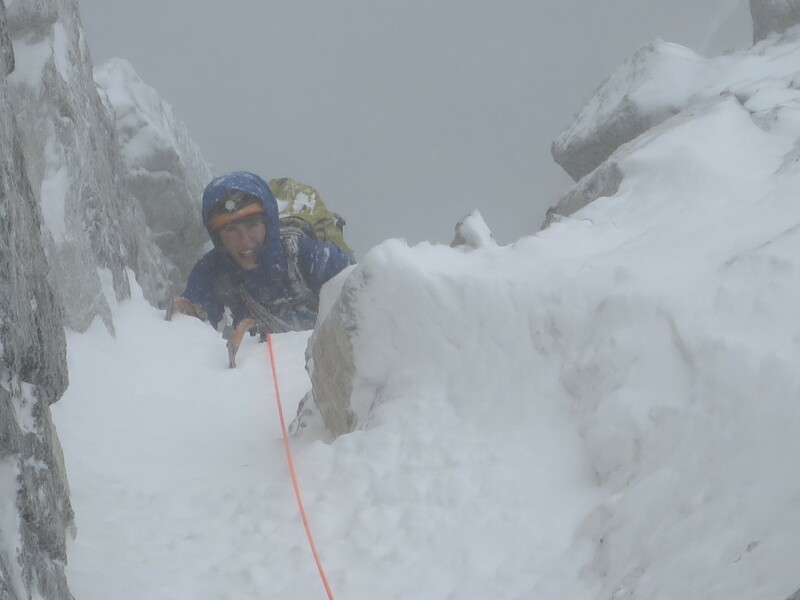 We roped up top of the huge debris cone and find out that first pitch leading to the couloir proper looked really dry. It went around M5 on a loose rock, but climbing was fun. Some judgy steep sections and one undercling traverse on a slab. Next couple hundred meters should have been a quick one hour romp, but we found deep snow. It slowed us a bit. Kalle romping up the lower couloir. 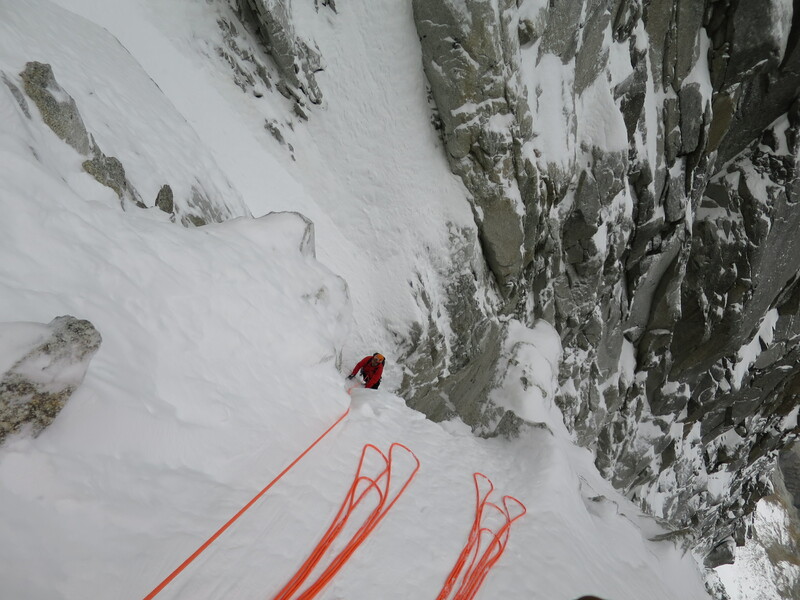 Meat of the route is a narrow gully which goes directly up the face. It can be climbed in four or five pitches and it offers wonderful mixed climbing. Conditions we encountered were superb. The first two pitches are long, but quite easy neve. Belay on the left side of the couloir. 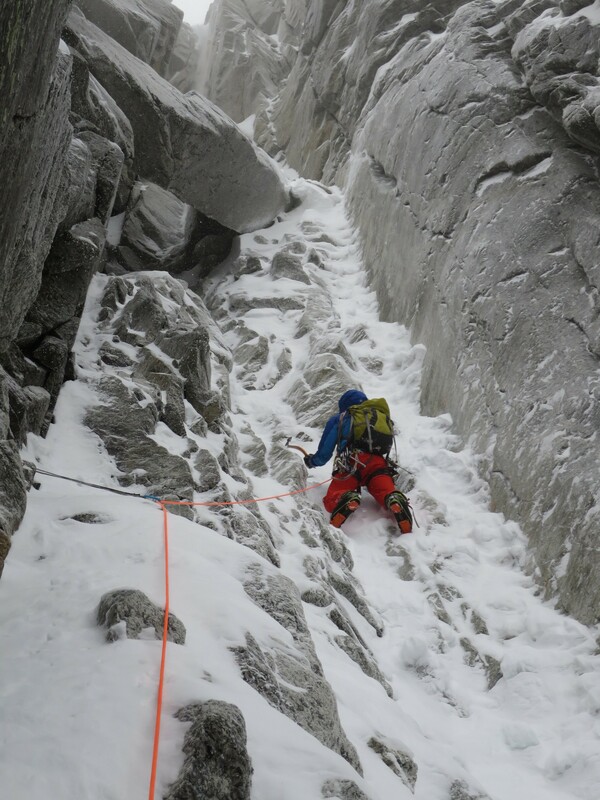 Third pitch goes under a jammed block (in-situ piton) and contain couple of harder moves. You can also pass the block via steep ice on the right, but protection migt be non-existend. The last pitch climbs a mellow runnel and ends to a very steep step. Good hooks and pro, but it can be pumpy. It´s also possible to avoid hard climbing via left-hand exit (loose spike). Kalle following the first neve pitch. Juho heading towards the jammed block. Juho exits the last mixed pitch. Once we climbed out from the depths weather deciced to turn against us. 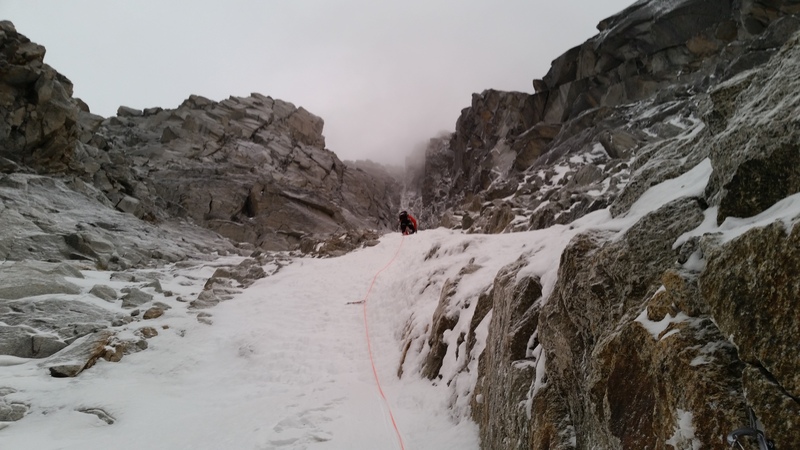 Last part of the route is easy snow climbing, but in high winds it felt pretty exciting. Some parties traverse under a big crevasse to the left and then climb up to the ridge, but went up the steeper terrain next to the rock. It felt like a safer option and you can just walk into Midi`s glacier tunnel top of the route. A few minutes later we were on the way down in a warm gondola. Chamonix, you know!